Using Twitter on your mobile devices is something that you should not miss doing most especially if you are often out – away from your desktop or laptop computer. It allows you to stay connected with your followers, have constant social and business updates from your community, send instant messages to your customers and prospects – among other updates that you should not miss even when you are mobile. But before you can use any mobile devices to access your Twitter, you will need to connect those devices to your account. This task should not be that difficult as Twitter has made the process pretty straight forward. Also, you can browse anytime you want the Twitter support page for mobile devices in case you need help. To cover the basics of this topic, I am sharing below some useful insights that could help make your mobile experience with Twitter better. 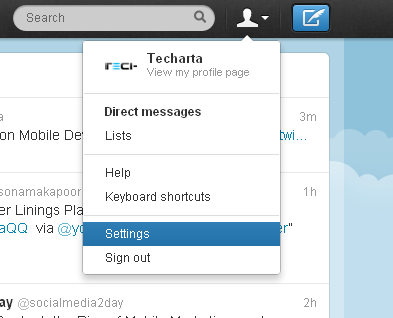 Step 1: Go to the Profile icon in the top menu, click on the dropdown arrow and click on setting. Step 2: After clicking the setting, you will be directed to the following page. Click on Mobile and this will show the page that allows you to add your mobile phone number. Click on the dropdown button to select your country and then input your phone number (just plain numbers) and then click the activation button. Twitter will display your phone number and provide the number that you need to send your text message to as well as the exact word to send. For instance, Twitter will instruct you to send the word “GO” to 40404 to validate your number. Let others find me by my phone number – if other Twitter user searches for users using his contact list and your phone number is on his list, Twitter will include you among the search results. 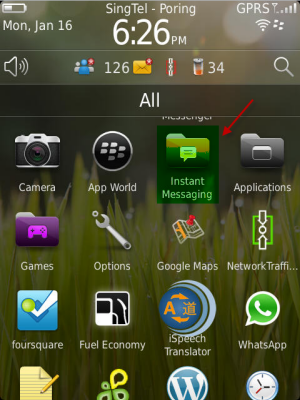 Direct messages – when someone sends you a private message, you will be notified via text. Mentions and replies – when someone mentioned you in his tweet or when he sent a reply to your tweet, you will be notified. And you can specify this further by choosing either “only from people I follow” or “from anyone”. Your tweet is re-tweeted – you can also specify this as “only from people I follow” or “from anyone”. Your tweet is marked as favorite – this allows you to be notified when someone ‘favorited’ your tweet; again, you can also specify this further by selecting whether “only from people I follow” or “from anyone”. Sleep Settings – this allows you to specify what time of the day you allow Twitter to send you notifications (e.g. you can block text notifications during bedtime). Password reset – activating this feature allows you to enable password reset via text message. Note: You can always change the above options anytime you want and you can delete you phone number or change with a new one as well. Once your phone has been set-up for Twitter use, sending tweets via text messaging is easy. Step 1: Just tap the text messaging icon on your mobile phone. Step 2: Type the message you want to post on your Twitter account and send it to the number that is assigned for you by Twitter (the number given when you added your phone number to Twitter). 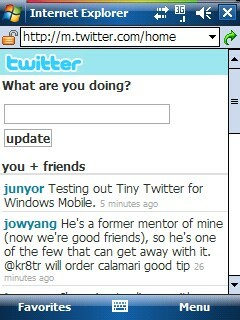 After clicking send, your Tweet should then appear on your Twitter stream. As usual, Twitter limits your message to 140 characters so take note of not sending more than the required number of characters to avoid your message from getting cut-short. If your mobile device allows you to view websites via web browsers, then you can access Twitter via that medium. All you need to do is to type Twitter (the URL) and you will be directed to its page designed for mobile devices. If you are accessing twitter.com on mobile devices such as in tablet, the URL will be converted to mobile.twitter.com or m.twitter.com for better user-interface. If for some reasons your mobile browser does not direct you to the specified URL, type it manually to access the Twitter page designed for mobile. There might be a slight variation on Twitter interface in various mobile devices but the main functionalities are present. Take a look at the following illustrations. 2. Allows you to view tweets where your account is mentioned. 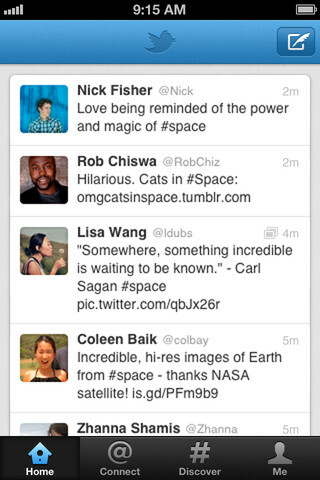 Twitter for iOS is full-featured yet it is designed to make the most of iPhone limited screen space. Check out the following interface. 1. Home – this is equivalent to Twitter homepage accessed on desktop or laptop computer; displays your homepage timeline or stream. 3. Discover – displays stories that might interest you as well as trends and suggestions on who to follow. 4. Me – displays your profile information and gives you access to your direct messages, draft, lists, and saved searches. 5. 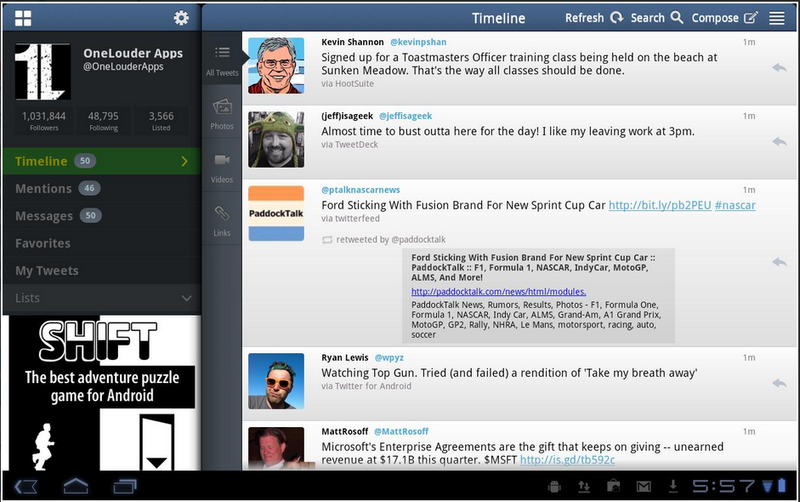 Tweet button – displays the interface where you can write and post a new tweet. Note: Twitter for android device is virtually identical to Twitter interface on iOS. The primary difference is that Android put the function icons on the top while iPhone (as illustrated above) put them at the bottom of its interface. Twitter has provided us the needed technology to stay connected across different platforms, there is no reason for us to be left behind on the trends, on ‘what is hot’ in our social community. Take advantage of this development – both for fun and business. Roy Van’s work for Agentsofvalues.com, helped improve his skills in the field of Search Engine Optimization and Marketing, Pay-per-click Advertising, Website Administration, Web Content Writing, and other Internet business-related tasks.